My husband and I are watching the TV show America's Next Great Restaurant hosted by Bobby Flay. I don't think that creating another "unhealthy" fast food restaurant chain is what America needs right now with obesity, diabetes, heart disease and cancer on the rise, but who am I to say. At least there are two contestants who are trying to serve somewhat healthy food with their concepts, HarvestSol and Spice Coast and I'm rooting for Spice Coast. 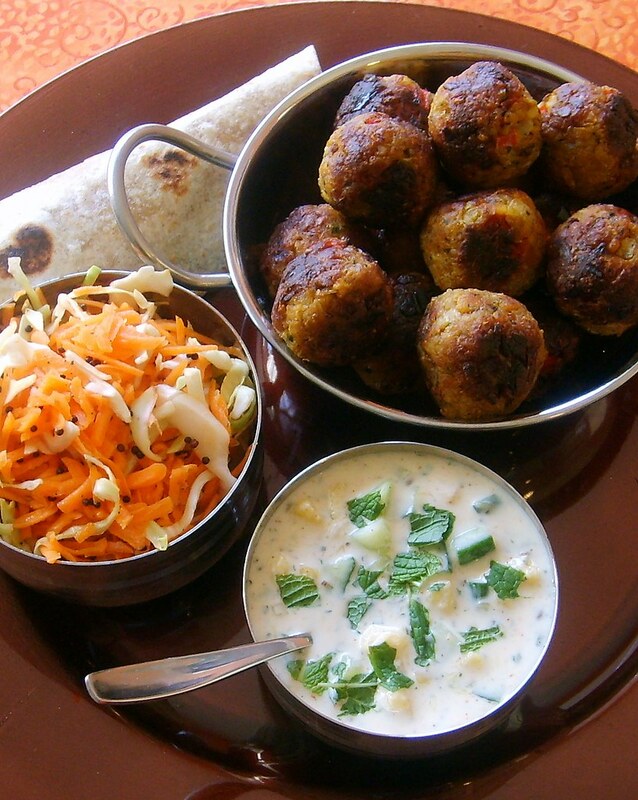 I like the idea of serving flavorful and healthy Indian fast food. Anyway, watching the show last night made me want to make Indian wraps--my version of Indian fast street food. And it was really good! One day, if I ever have my own vegan restaurant, this will probably be on my menu. Along with a Greek Gyro of course...but that's another post! Heat saute pan on medium, add canola oil and saute onions and red pepper until soft. Set aside and cool to room temperature. Grate tempeh with a box grater in a large bowl. Add onions and red pepper. Add the remaining dry ingredients and spices and mix well. In a small bowl, mix tomato paste and water and pour into dry ingredients and mix well. Using a small ice cream scooper, form mixture into 16 balls, pressing to make sure that they are firm. Heat a large cast iron skillet to medium and add 1 tbsp canola oil and brown tempeh balls turning frequently until brown and crisp on all sides. Mix all ingredients in a medium bowl and chill for at least an hour for flavors to develop. Heat canola oil in saute pan on medium heat, add mustard seeds and toast for about 1 minute until seeds start popping. Remove from heat and immediately pour over carrot salad. Toss with lemon juice, salt and pepper. Serve with multi-grain rotis or whole wheat tortillas, lightly brushed with olive oil and grilled until lightly charred. Enjoy!